I watched with horror as the video played on the national news website. Flames on either side of the road, the sky dark as night, branches falling on top of the truck. In my head, I knew this person must have made it out alive, because after all, the news had gotten the video. But the pit in my stomach made me wonder if he did make it out alive. That feeling of desperately trying to escape fire comes vividly back, as I remember the day two years ago I drove at breakneck speed to escape the Cold Springs Wildfire. Today’s wildfire started in the foothills northwest of San Francisco near Chico State University in northern California. What had started out as a 10-acre blaze this morning has turned into an 18,000-acre inferno tonight. Gusting winds will do that. Someone must have been had a cruel sense of humor to dub this fire the Camp Fire. It used to be 20 years ago that wildfire was something that you only worried about during the summer — June until September. But climate change that brings ever hotter temperatures to the west coupled with drought conditions means in reality there is no end to fire season. 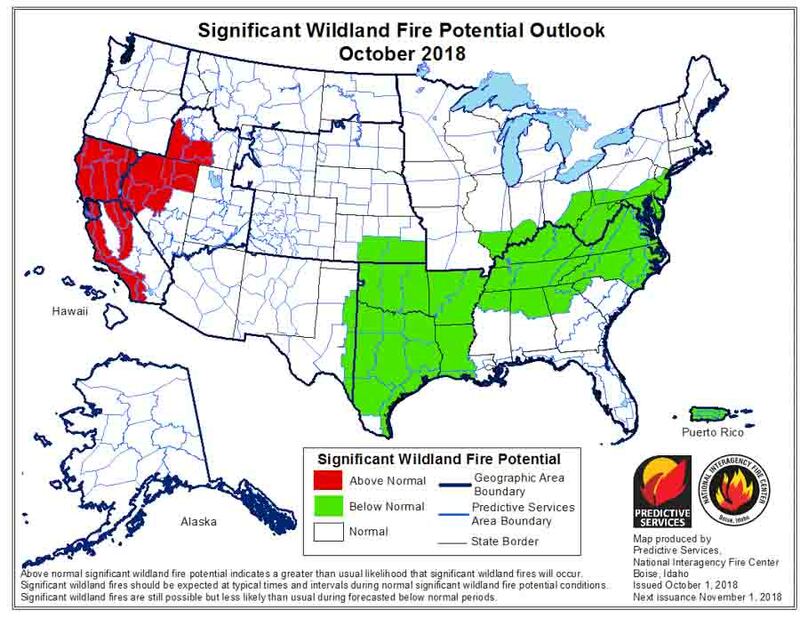 Wildfire Today put out a forecast a month ago showing significant wildfire potential for much of California well into January. Throw in the Red Flag Warning forecasted this week for northern California, and conditions are ripe for a fire. As a home owner in the wildfire zone, I feel the only days I can truly relax is when there is snow on the ground. And history bears this out, even in Colorado. Twenty-eight years ago, a man threw a burning mattress outside his front door and sparked a 3,000-acre wildfire that burned down ten homes. The Olde Stage Fire that started on November 24 was the largest in Boulder County’s history at the time. A second Olde Stage Fire started nearly twenty years later in January, 2009. That fire and another one nearby both were started by power lines blown down by strong Chinook winds coming off the mountains. The two combined also burned upwards of 3,000 acres. With the temperatures in the west forecast to continue getting warmer, the reality is that any dry period combined with gusty winds will make fires possible. Know where you fire boxes are, keep those evacuation plans firm in your mind. Winter is also a great time to update your home inventory, both with photos and a list. Finally, stay on top of wildfire mitigation throughout your property. Mitigation is a day-by-day, week-by-week, and month-by-month proposition that never ends. You may think that you really love that tree that’s two feet off your front porch, but ask yourself this. If that kind of fire broke out here, wouldn’t you want to feel you had done everything possible to create defensible space around your home? Would that tree really matter to you in that moment as you wondered if your house had burned down? In the meantime, thoughts and prayers go to our mountain living brethren in northern California. What’s in Your Fire Box?